A superhero-adjacent series like Agents of S.H.I.E.L.D. lives and dies on the strength of its villains, and while you’d be hard-pressed to pick out any particular foe as a great enduring character, Ward has at least proven the most consistent. 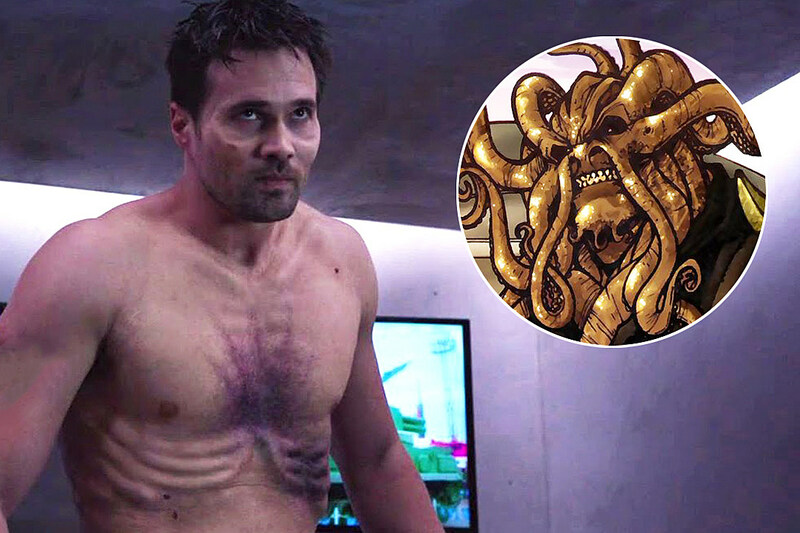 Still, re-cajiggering the character we know into an ancient Inhuman alien with an absurd and expensive design is a tall order for Brett Dalton, and in the same way the pre-Winter Soldier Ward seemed flatly noble, the sneering Hive proves equally one-note. 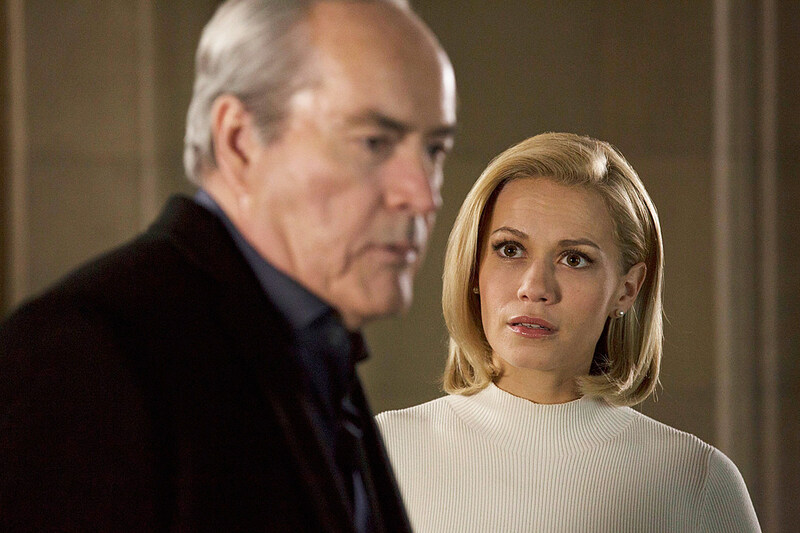 That’s part of what made Powers Boothe’s Gideon Malick such a strong addition to the series, even if seemed apparent at the jump that the two would come to jockey for power, especially in light of the vision Malick experienced last week. Boothe provides a strong enough characterization on his own, though it’s at least of interest for “Paradise Lost” to look into his personal history to explore the division of Hydra branches, and return Reed Diamond’s always-colorful Daniel Whitehall in the process. Of course, Agents of S.H.I.E.L.D. has a tendency to telegraph its punches, and “Paradise Lost” tips its hat toward Malick’s brother having been absorbed by Hive far earlier than the hour intends, repeating the gesture of throwing stones in the pond. It’s a strong scene for Boothe at least, to defend having suffered the same cowardice as his father in cheating his way out of the “ritual” and inadvertently sacrificing his brother’s life, though Boothe brings far more presence to the revelation than either of his scene partners, Dalton, or the already-dispatched Bethany Joy Lenz as Malick’s daughter, now a wormy husk. Obviously, the moment is there to fake out Malick’s vision of his own death, but it’s still at least a bit odd that Hive practically invites his co-conspirator to betray him with something so drastic as killing off his daughter. For all its improvements over the last three years, Agents still unfortunately leans on some of these weaker dramatizations, also seen tonight as Coulson’s guilt over killing Ward finally catches up with him, literally and figuratively. It was a notably dark turn, and Coulson’s been walking that line with S.H.I.E.L.D.’s morality ever since, but “Paradise Lost” lacks a compelling counterargument for more intimate scenes like his ultimate conversation with Fitz. It was a moment of impulsive vengeance in the getaway from an alien world, one rendered practically mercy by Ward’s already fatal wounds. Even then, there’s no reason to believe Hive wouldn’t have taken Ward’s body and escaped to Earth anyway, so why linger? And for reasons I will never fathom, Agents insists on mining anything remotely interesting in the relationship between Daisy and Lincoln, this week dispatched to find a volatile Inhuman “potential” in possession of some ancient knowledge. It worked a few weeks ago, to explore Lincoln as an uncertain recruit under Coulson’s tutelage, and perhaps the romance exists to fill a certain quadrant in the show’s demographic, but it feels violently uninteresting that the trip would serve to bring about revelations of Lincoln’s alcoholic past, or once-endangered ex-girlfriend. Worse, even, that Daisy would put the entire mission on hold* to confront him about it, as well the transparency of their relationship, especially given the girl was revealed to be just fine. *As to the space Quinjet vision she confesses in return, I’ll forgive that Daisy’s discomfort with her own potential demise keeps her from sharing with the team, at least for an episode or so. Any longer, and it’s seriously endangering her friends. This, from the girl actively detonating landmines in people’s faces. At the very least, the expedition sheds a little light on the Kree history behind Hive, and the main team’s mission to capture Giyera nicely pivoted into a setup for Daisy to finally assemble the Secret Warriors next week. May’s fight with Giyera proved a particular highlight as well, cleanly staged with a fun concept, but for an hour largely focused on the bad guys, “Paradise Lost” couldn’t find much good to do. Effects on Ward’s squiggly Hive head looked good, and accurate to the comic, at least by what they showed us from behind. So … does Coulson’s new hand have a laser finger, or what? Replace all the talk of “Malicks” with “Mandelbaums,” and the episode becomes much more enjoyable. We couldn’t just give James some powers? Guy had a whole Wolverine thing going on. Something about birds, and pesticide! Environmental endgames are so hot right now. Giyera could still toss May around by her clothes and shoes, right? Agents of S.H.I.E.L.D. will return on April 19 with “The Team,” airing at 9:00 P.M. on ABC.